New technology should accelerate your studies, however, for many research sites new technologies end up adding complex and redundant processes for your team. Avoiding these additional processes requires tight integration. Moreover, many technology solutions claim to have integrations but it is important to ask exactly how they will integrate with the systems you are already using. How can you plan without being a computer geek? After completing hundreds of implementations, the Florence team that the following are most often the top priority for integration. Florence eBinders integrates with all of the following systems and our team works with every customer to ensure seamless integration with other tools they are using. Five integrations your eRegulatory system must have, and why they matter. Eliminate manual transfer of source documents with instantaneous uploads into a regulatory eBinder. Eliminate paper binders and shadow charts and capture source docs in a compliant and secure way. Accelerate study startup by automatically assigning appropriate team members to the correct study in your eRegulatory system when you create a study in your CTMS, while also triggering document workflows, like FDA 1572 and Financial Disclosure, with auto form completion and eSignature requests for review and approval. Florence recently introduced the Florence Magic Button – linking your CTMS system directly with Florence eBinders. Want to know more? Get in touch. Never miss another email. Forward email study correspondence directly into the appropriate site/study to capture both the body of emails and attachments included to avoid downloading to PDF and uploading every time. Stay on track with FDA submissions from the start by maintaining the required structure for an FDA submission, and sending it through the gateway directly to the FDA when ready to close the study. SAML integration that allows your team to log into eRegulatory securely when they log into their main organization system. 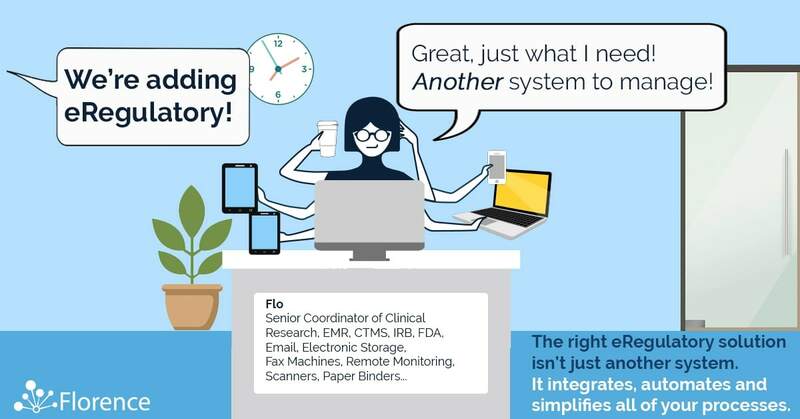 Interested in how Florence eBinders can accelerate your research with a truly integrated eRegulatory solution? Let us know! We’d love to setup some time to chat.